I just loveee Wontons! I had them growing up in my dad’s restaurants; and I’ve had some at Chinese Noodle-Style restaurants; and I’ve had it in Chinatown served with a side of piping hot peanut butter noodles! It wasn’t until I had kids, that I was inspired to make my own because I seldom go out to eat. Who knew it was so easy to make?! My version is a bit different from regular Chinese take-out restaurants that often use soy sauce, not fish sauce. Mine is more like the type served with a side of PB Noodles. I hope you get to try out my version. 1- Thoroughly mix all ingredients above except for Wonton wrappers. 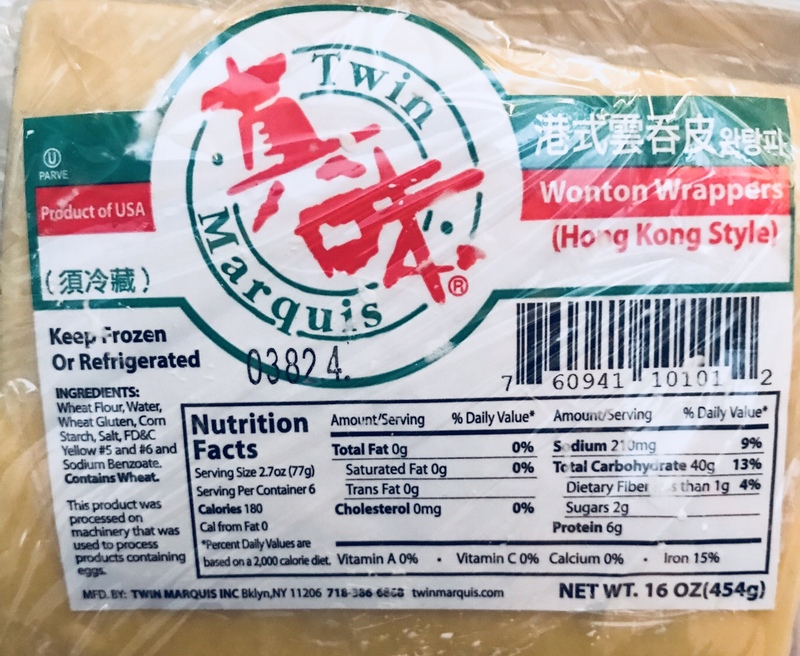 2- Wrap wontons. Put in 1 tsp of meat in the center and fold across diagonally to tuck one corner under the meat. I must’ve put about 1.5 tsp because I was in a hurry to finish making them. You should end up with a triangular shape with 3 sides. Dampen one end with water and press the two pointy corners together ( kind of like a C Shape). I’d say pretty much as long as it’s folded somehow and there are no inside contents sticking out, you are good to go. Super Diaries have a great step by step photo on various ways wontons can be folded here. 3- Bring water to a boil and dump in wontons being careful not to overcrowd it. Allow the water to go back into a boil, until they all float on top and boil for another 3-5 minutes after. Don’t overcook it because it can get gooey and fall apart. In a small soup pot, maybe do 12-15 pieces per batch. Scoop out into serving bowl. *Note: If you let it sit too long in a regular bowl, they can fall apart tans all get clumped together. Chose a way below to finish it off and eat it (or serve in rectangular like bowl so that none of them are touching each other. 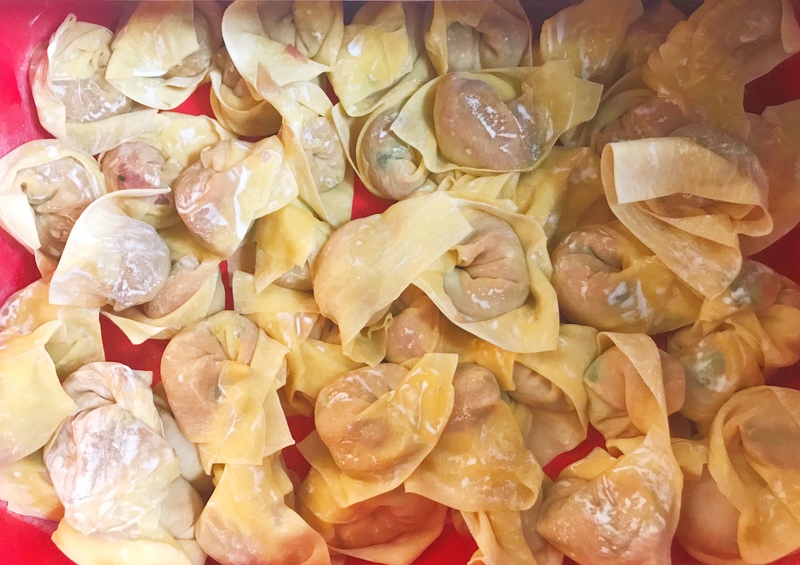 **Note: Uncooked wontons can be frozen single layer at a time or layered with parchment or plastic wrap paper in between. Of course mine are overcrowded as usually due to lack of time. Once frozen, it can be put into a ziplock for busy nights and a quick meal. A-You can eat it plain the way it is. B- Szechuan style with a drizzle of chili oil, a little soy sauce (start with 1 tsp) , about 1/2 tsp sesame oil, and minced scallions. C-You can also turn it into a soup and after you fish the wontons out and adding fish sauce and vinegar to taste (start with 1/2 tsp); and a drop of sesame oil; topped with minced scallions. D- You can never go wrong with deep frying them! I like to deep fry cheese wontons (will be doing another post in that). E- Upgrade your instant ramen and make it more filling by throwing in a few. Don’t you just love how versatile and easy this wonton recipe is? 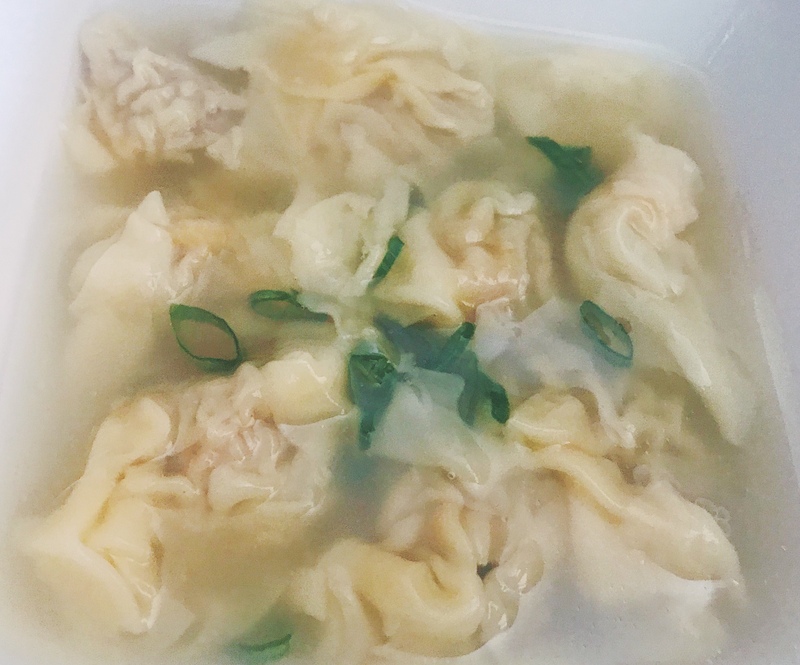 What do you like to put in your wontons? Sometimes, I like to add minced shrimp, shiitake mushrooms and water chestnuts to the meat mixture to mimic what I get sometimes at Chinese Noodle Restaurants in Chinatown .